This episode: Newly discovered CRISPR-inhibiting genes are found in many different bacterial groups! This episode: Phages may be passing through the barriers in our body all the time! This episode: Phage therapy can work very well when combined with an effective immune response from the host! This episode: Certain transposons, genetic elements that move around the genome on their own, have co-opted the bacterial immune system, CRISPR, to use for jumping to new hosts! This episode: New type of secretion system discovered that bacteria use to stab amoeba predators to escape their digestion! This episode: Phages bound to magnetic nanoparticles can be guided and pulled toward their target, penetrating biofilms to kill harmful microbes! 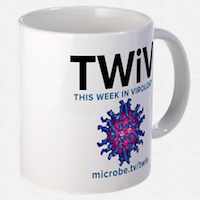 This episode: Even organisms as simple as viruses can communicate with each other!